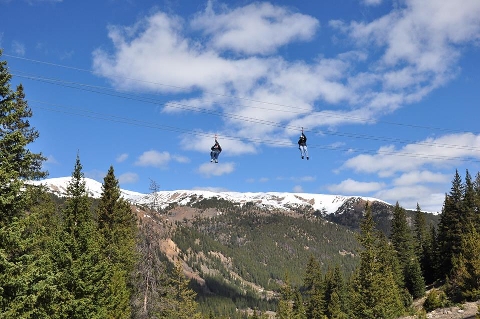 TOP OF THE ROCKIES ZIP LINE IS LOCATED 1 HR & 45 MINUTES FROM METRO DENVER, MINUTES AWAY FROM BRECKENRIDGE, FRISCO, KEYSTONE, DILLON, SILVERTHORNE, COPPER MOUNTAIN, VAIL, BEAVER CREEK and LEADVILLE, COLORADO. ASPEN IS 1-1/2 HOURS VIA HIGHWAY 82 OVER INDEPENDENCE PASS. We are conveniently on the way to all rafting adventures in the Arkansas Valley. 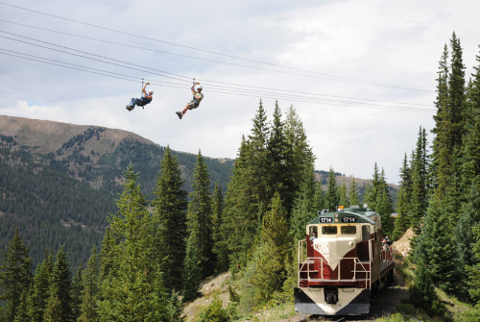 Enjoy the standard Two-Hour PROSPECTOR ZIP LINE TOUR; a true Colorado Back Country Adventure. Check-in 30 minutes prior to tour time. 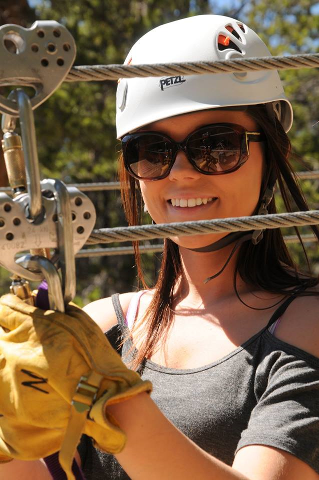 Meet your professional zip line guides and get all of your equipment. We provide full body harness, helmets and gloves. Please bring sunglasses for eye protection and wear comfortable walking shoes. Long pants are recommended, closed toed shoes like hiking boots or sneakers are most appropriate. ALL OF OUR TRAILS ARE DOWN-HILL SO IT'S EASY WALKING. TEMPERATURES GET VERY WARM IN THE SUMMER IN MOST PARTS OF THE SURROUNDING AREA. THAT INCLUDES DENVER TO THE EAST, BUENA VISTA TO THE SOUTH, AND AREAS WEST OF VAIL. 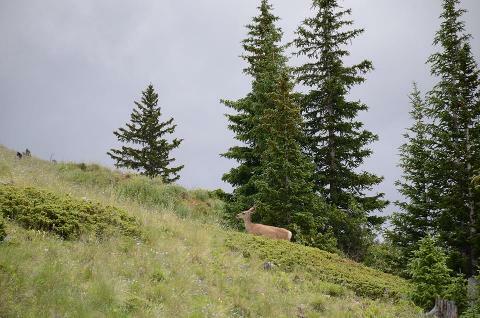 It's a different world there but It is always COOL AND COMFORTABLE ON OUR PROPERTY EVEN IN THE MIDDLE OF SUMMER so bring an extra layer, sweater or hoodie, just in case.. Feel free to carry a small back pack for bottled water or a cell phone. An independent photo service is on site but feel free to take photos with camera or cell phone. Complimentary raincoats are provided in the event of passing showers. After you are all geared up, it's time for flight training school. A brief safety talk will be followed by a practice zip on a training line. 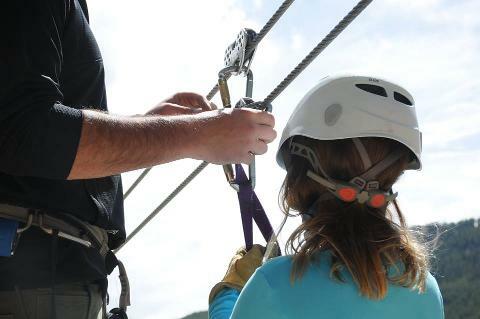 Look overhead and see those TWO HEAVY CABLES and that double hookup on your harness. You are not flying on one wire. Every element on your hook-up is backed up. Now you're comfortable and ready to go. 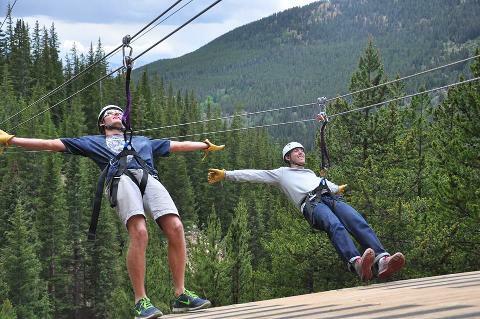 Don't worry bout a ting cause every little ting gonna be OK.
Tour includes all 6 ZIP LINE SECTIONS, over 8,000’ feet of zip lines at the Top of the Rocky Mountains. 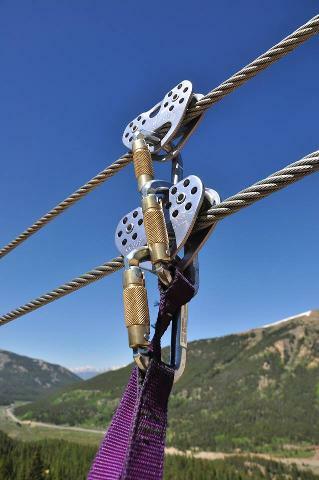 Hook to TWO OVERHEAD CABLES FOR ULTIMATE SAFETY. 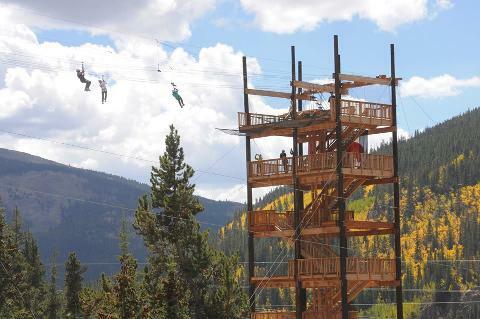 After check-in at the Base Camp at our 2,500 acre Private Preserve, board 6-ton MONSTER TRUCKS or comfortable 4-wheel drive vans for the scenic drive up steep winding trails to the first zip line departure deck at 11,200 feet. 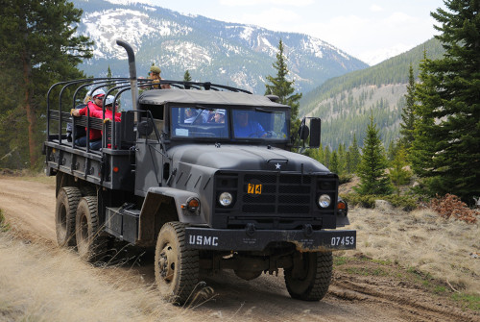 The shuttle vehicle used will depend upon trail conditions and number of guests booked for the tour time. Enjoy spectacular panoramic views of Mt. Elbert and Mt. Massive, two of the tallest peaks in North America from the deck of our Yurt. See some of the old historic patented gold mines on the property as well as possible wildlife sightings. Experience different elements of speed, distance off the ground and terrain ON EVERY UNIQUE SECTION. Fly on One Single, side-by-side on 4 TWIN LINES, and side-by-side-by-side on TRIPLE LINES on THE BIG NUGGET, “THE GRAND FINALE”. Don’t worry about braking on our course. Our braking system will slow you down for a smooth, safe stop and one of your guides will be waiting on the landing deck to assist. At least two guides will accompany all tours. 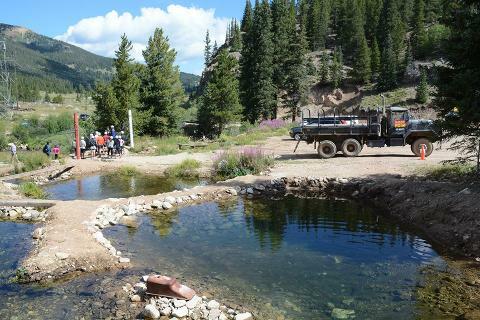 Stop at one of the bubbling streams in the area for cold drinks and snacks. Easy to access take-off and landing decks are flat on the side of the mountain; you don’t have to climb ladders up into trees or wooden towers. 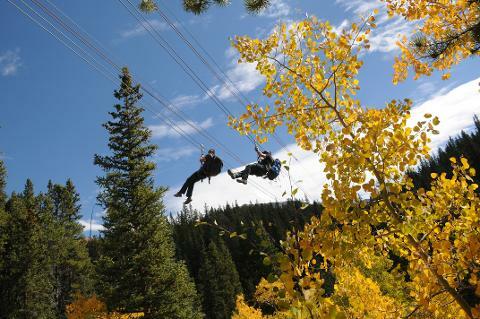 Zip Line Sections are connected by scenic downhill trails through the forest, so it’s easy walking. After completing zip line #5, it’s time for THE BIG NUGGET. 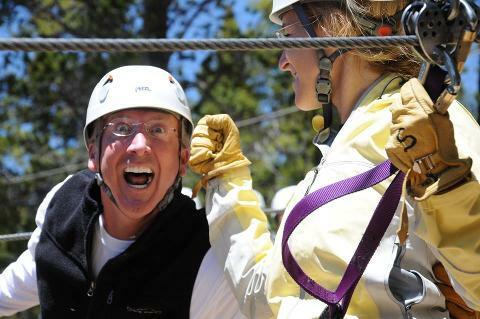 Guests glide down on three thrilling zip lines, past the rocky cliffs on long 850’ cables. Land side-by-side-by-side on our beautiful 100’ tall SKY TOWER. 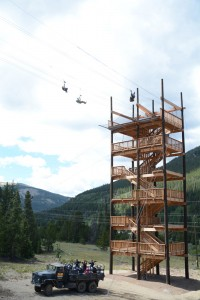 Stop and take photos on the 6 spacious landings as you descend to base Camp on wide stairways. 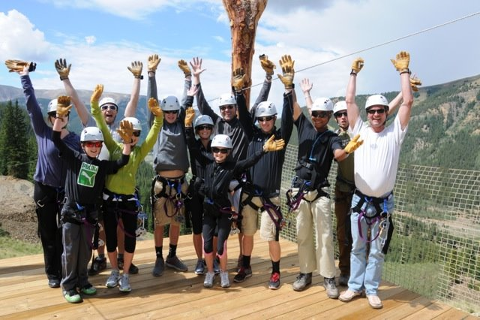 Enjoy magnificent views of the 14ers, Mount Massive and Mount Elbert to the south, and our mountain, Mount Arkansas (an almost “Fourteener”), overlooking the Base Camp. Plan to spend approximately 2 to 2-1/2 hours on this exciting tour. 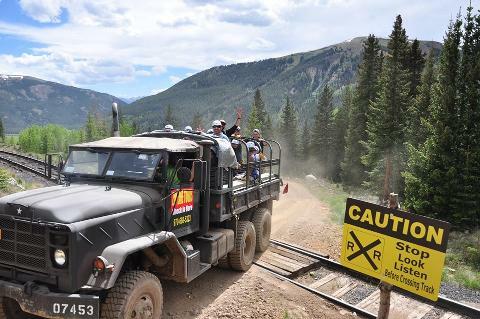 Certain tour times provide an opportunity to see and hear the historic Leadville Colorado & Southern Railroad train as it travels across our property high on the Continental Divide. One zip runs parallel to the tracks while another section runs over the tracks. Fly-overs are not guaranteed but some guests will fly over the train with an “eagle’s eye” view. We have a 48 hour cancellation policy on all tours. All guests will be required to sign a standard Liability Waiver. Guide gratuities are appropriate and appreciated. 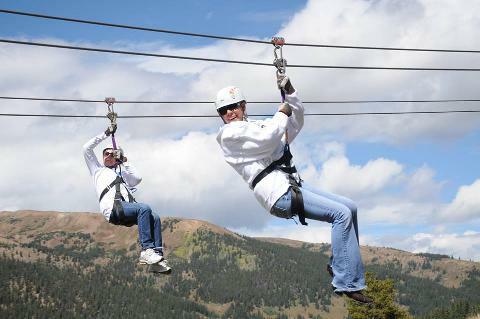 Weight Restrictions apply: No one under 50 pounds or over 260 pounds can zip line. Weather is extremely changeable in our high mountain area. Most weather forecasts are undependable and do not apply. We do not cancel tours in the event of light showers; usually they pass by quickly and we continue the tour after a brief wait. We do reserve the right to cancel tours because of extreme weather. In that event no charge will be made and tour can be rescheduled. We are located on Highway 91 south, only 15 minutes south of Copper Mountain from Exit 195. 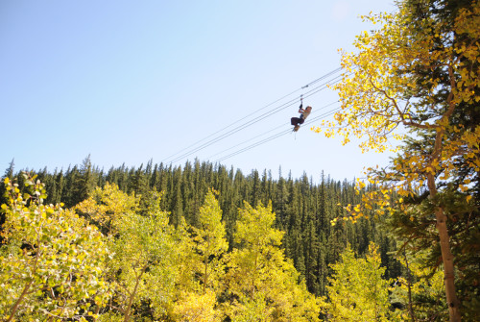 In the late spring, summer and fall, Aspen is approximately one and one/half hour away via scenic Independence Pass. TOP OF THE ROCKIES IS CONVENIENTLY ON THE WAY TO ALL RAFTING ADVENTURES. USE OUR ADDRESS: 6492 Highway 91, Leadville, Co. 80461 for your cell phone navigation. We are just south of Mile Marker 7 on the left side of Highway 91, Look for the red, white and blue flags on our driveway and the 100' tall tower in the parking lot, with four flags flying. Check in at the red two-story building.